How much does a lightweight bike weigh? The question: "What is a light bicycle?" is a bit like the question of whether pears are heavier than apples. Of course it depends on the equipment. 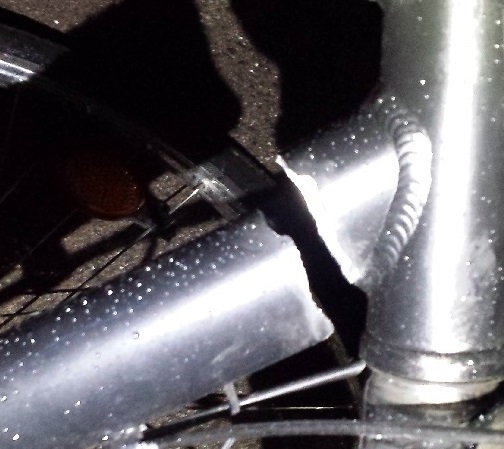 And the belief that aluminum bicycles are lighter in any case than steel bicycles is not true, as I just noticed in a risky self-experiment with my bicycles. After about 100 years of bicycle history and development you could think that the question of the more suitable frame material would have been clarified. Despite its hardness, steel is an elastic material and neutralises the forces that occur when cycling, with a slight loss of power with regard to the transmission of power to the road. Before a steel frame breaks, it bends sooner. Aluminum is very stiff and transfers the forces to the road better than steel. Unfortunately, aluminum is also susceptible to breakage, as the repair workshop of your trust will certainly confirm. What raises for me the question whether a weight savings of amble 500 to 1000 grams (measured on my bicycles) is in a healthy relationship with safety considerations regarding the use of aluminum. The suspension forks, which are intended to compensate for the stiffness of the aluminum frame, compensate the reduced weight also. On top, you can easily drop a few hundred bucks to get a good suspension fork. And even them are often very willing to be repaired soon. Incidentally, bicycle frames made of aluminum are not particularly sustainable, not only because of the shorter life expectancy but also because of the considerably poorer energy efficiency. Who in the end pulls the profit from aluminum frames and forks, you decide yourself. Just ask for fun, how long the bike dealer of your trust gives you a guarantee for his sold aluminum frames! To say it in advance: If you only want to save weight, you can certainly put together a bike with only 7 kg. Just leave away all that is somehow durable and suitable for everyday use. Anyone who somehow understands something of it will then realize that you have pocketed hundreds of dollars in this marvel. Nevertheless, you will not win the Tour de France with it. That works different. The approximately 300 bicycles of the bicycle rental "Experience Hamburg differently" served the following average values as a basis. For the steel frames, I already use the lightest model series. Of course, there are considerably heavier ones. Heights over 24 inches are of course heavier and have not entered the rating. The lock weight of each bike (div. Abus* spiral locks ~ 500 g) is included. This is not about whitewashing! If you compare these weights with other bikes, please note that safety, reliability and longevity are my top priorities. Only then does a weight saving come into consideration and you also have to deduct the weight of the lock. Current city bikes made of steel with full equipment, like hub dynamos, 7-speed hub gears, mudguards, steel luggage racks and steel handlebars weigh between 19 and 20 kg; that equals bicycles from the 50's! City bikes with aluminum frames weigh up to one kilogram less with the same equipment, which hardly makes any sense at around 20kg. (not equipped with suspension forks). My lightest city bikes weigh between 17 and 19 kg and are made of stainless steel. Fully equipped steel/aluminum trekking bicycles weigh between 16 and 19 kg, though it should be noted that my lightest trekking bike has a steel frame (without suspension fork). Parts of the weight savings are due to the lighter circuits. The mountain bikes (26' inch) made of aluminum without suspension fork weigh 14 kg and those made of aluminum with suspension fork 15 kg. My most expensive mountain bike (fiberglass and suspension fork) weighs 13.5 kg. Logically, there are lighter mountain bikes, but their use in a bicycle rental in Hamburg is out of the question for the high cost and low demand. Current children's bicycles (24 inches) with aluminum frames, hub dynamo and 3-speed hub gear weigh a devastating 14.5 kgon average, which can not be fun for dwarves. Sorry. I didn't found lighter ones yet. The tandems (steel frame) move with roundabout 29 kg over Hamburg's streets so you end up at 14.5 kg per person. The "classic road bikes" (steel frame) are on average at a flattering 11.5 kg. The equipment of the bicycles - for my customers only the best! These are well-maintained bikes for me. My babies, lovingly put together screw by screw, as light as possible, but with the supporting and safety-relevant components such as frame, handlebar and luggage rack preferably made of steel. Thus you are well served with steel in terms of safety and reliability! Read: sustainable components! Tires: puncture-proof tires on all wheels except for racing bikes and exotics. Luggage carrier (steel): up to 25 kg payload. Handlebar (steel): Safety first; that's clear, exception: road bikes, here I use high quality handlebars made of aluminum. Hub dynamos and side runners Dynamos: Many city bikes and all children's bikes with hub gears have hub dynamos. Trekking bicycles (derailleur gears) mostly have side-runner dynamos. For the headlights, I use basically high quality halogen or LED bulbs, some taillights have parking lights. Hub gears: In the 7-speed hub gears, the Japanese made the race. From the 7-speed gear hub, I use an almost fossil series, the SG 7C 20 or the even better SG 7C 21. These are more durable than other series and the switches used are the only switches I know that can not get broken when the bike tips over. They are mounted well protected by the handlebars. Derailleurs: Shift, brake and drive components from LX *, Deore *, XT * or equivalent (aluminum). If possible, patent seatposts (aluminum). For more components, please see the bike descriptions or photos within the pics galeries. All children's bicycles made of aluminum. Here are the forces too weak for a frame break (I've never heard of it). Mountain Bikes: Newer high-priced models are available only in aluminum. The aluminum alloys and switch eyes of earlier production lines seem to have been improved - but: Rental only at your own risk! Have a good and safe ride! * Mentioned or pictured brand names as well as brand logos are property of the respective company and serve only the description of the article.